Morning talk shows and nightly news segments are abuzz with the promise all Americans over 40 are desperate to hear: "Say So Long To Reading Glasses" and "The End of Reading Glasses" blaze headlines. But before you open your wallet and throw your progressives and drug store reading glasses out the window, let's talk the real science behind what the newly FDA approved presbyopic refractive surgeries can truly accomplish and what they can't. Many are finding success with these treatments, but only after they have clear expectations for what is possible, what isn't, and what the risks include. What is Presbyopia? 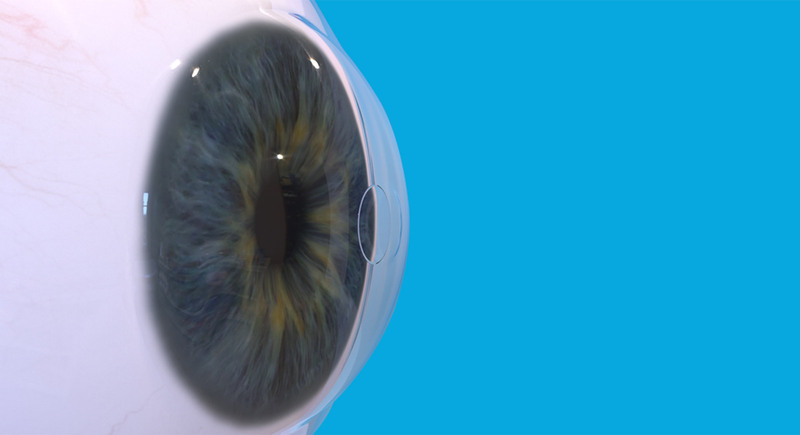 Around age 40, our eyes begin having difficulty focusing up close. Looking at books, cell phones, and computers gets more and more difficult with every passing year. This is a completely normal change associated with the aging eye, and no humans are immune. There is a popular misconception that presbyopia is a weakening of the muscles of the eye, but in fact the muscles are just as strong as they've ever been. This is why eye exercises or the idea of avoiding glasses wear to "use your eyes" unfortunately won't work. The reason we lose our ability to focus at close ranges is because of the lens, a structure of the eye that sits right behind the iris. The lens changes shape to focus vision near and far, and the muscles of the eye control this movement. From the day we are born, the lens lays down layers like a tree trunk -- it's one of the only body parts that never stops growing. Year after year the lens is layering and thickening, and around age 40 it has gotten so thick that it is very difficult for your eye muscles to move and adjust its' shape. And it just keeps getting thicker every year after, eventually to the point that the muscles can barely move it at all and you would need reading glasses to focus clearly on nearly all close objects. With today's science we can't thin down the lens to restore flexibility, and if we remove the lens we don't have any artificial lens implants yet that can truly mimic the flexibility of the original. The presbyopic refractive procedures on the market at this time do not affect the lens at all, but instead try to improve near vision through changing the corneal surface of the eye. This is important to understand because both the KAMRA and Raindrop procedures available can't give you 20 year old vision again. The vision will be different from that provided by young, naturally flexible lenses, but if you are prepared for what they can achieve, you may still find success! What It Is: The KAMRA Inlay is a solid dark ring implanted in the cornea in the center of the visual axis (the middle of the pupil) to create a pinhole effect. 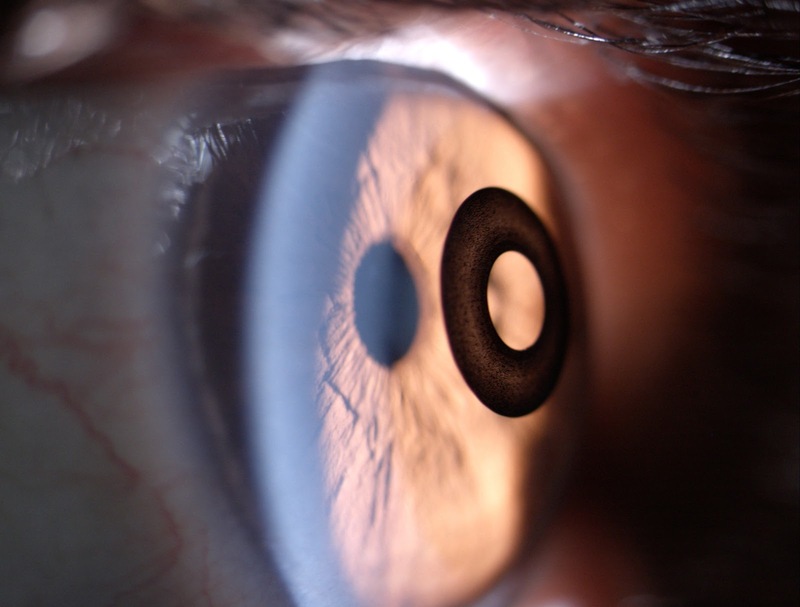 The device itself is just 3.8 mm in diameter with a 1.6 mm pinhole in the center for vision. Due to the optics of a pinhole, objects will appear clear at a range of distances when viewed through such a small "window" because the pinhole blocks light rays that would be entering the eye off angle (which would make things appear blurry). It's the same way a pinhole camera works if you are wanting to learn more. The inlay itself has 84,000 small holes to allow oxygen and nutrient exchange through the inlay to the corneal tissue underneath. Who is a Candidate: Age 45 to 60 years old requiring reading glasses between +1.00 and +2.50 in strength. Who is Not a Candidate: People with cataracts, corneal degenerative conditions (like keratoconus), uncontrolled diabetes, glaucoma, immune system disorders, a history of corneal infections or scarring or dry eye are not candidates. The Procedure: Only one eye (the nondominant eye) will have the KAMRA inlay placed into the cornea with an outpatient laser procedure, leaving the dominant eye to have clear distance vision. The eye with the inlay will have a range of both distance and near vision, and the untreated eye will only see distance. The inlay can be removed if there are complications or if vision isn't acceptable, but it is possible that scarring will have occurred where the inlay was placed and vision may be permanently damaged even after removal of the inlay. The procedure is often coupled with LASIK or PRK to achieve prescription-free distance correction. The inlay eye is ideally left undercorrected at distance by -0.50 to -0.75 D at the time of surgery to improve near function. Before surgery, no patients (over 500 participants age 45-60) could see 20/40 or better at near range (40 centimeters) without glasses. 1 year after surgery 83.5% of patients saw 20/40 better in the treated eye. What It Is: The Raindrop inlay is a clear, 2mm disc that is implanted in the stromal tissue of the cornea in the center of the visual axis. The shape of the Raindrop creates a change in the central corneal curvature, resulting in the very center of the eye being enhanced for near focusing vision. The Raindrop inlay is clear so it's hard to see in an actual microscope picture. Above is a diagram of the 2 mm raindrop inlay in place and below is a slit lamp photograph showing the inlay in a real patient. Who is a Candidate: Age 41 to 65 years old requiring reading glasses between +1.50 and +2.50 in strength. The Procedure: Only one eye (the nondominant eye) will have the Raindrop inlay placed into the cornea with an outpatient laser procedure, leaving the dominant eye to have clear distance vision. The eye with the inlay will have a range of both distance and near vision, and the untreated eye will only see distance. Before surgery, no patients (over 300 participants age 45-60) could see 20/40 or better at near range (40 centimeters) without glasses. 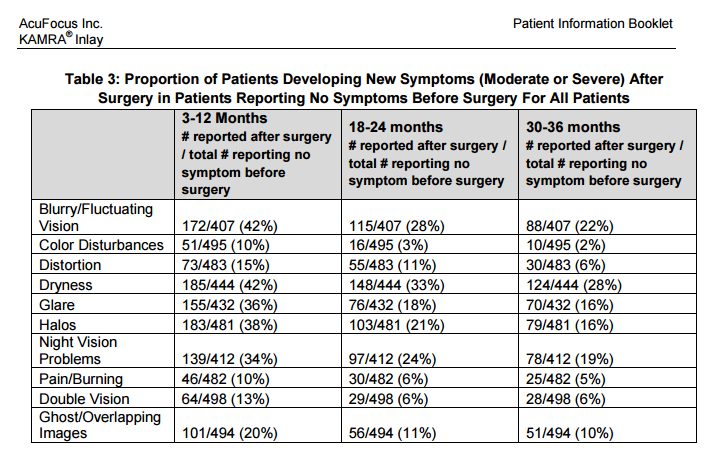 2 years after surgery 92% of patients saw 20/40 better in the treated eye and over 75% were 20/25 or better. Common vision complaints in the treated eye include: glare, halos, blurry vision, reduced night vision, dryness or burning, changes to color vision, double vision, and ghosting. The inlay itself may increase the risk of cataract formation, and may cause increased eye pressure (a potential risk for glaucoma). The inlay is not recommended in people with dry eye because of the associated risk for significant visual distortion, halos, and disappointment with visual results. Medications that cause dry eye are also a contraindication according to both companies. These include: isoretinoin, anti-histamines, beta-blockers, birth control pills, diuretics, and drugs for the treatment of cardiac arrhythmia. The inlay itself can make it more difficult for your eye doctor to examine and assess the health of the eye because it is blocking their view through your pupil. This is why it is not recommended in patients with ocular conditions like glaucoma or macular degeneration, or for people with chronic medical conditions like diabetes where there is a high risk of retinal damage that needs careful observation. This is more of a risk with KAMRA where the inlay is actually a dark ring that would physically obstruct the doctor's view. Because the inlay is placed in the cornea, there are reports of corneal damage even after the inlay is removed. 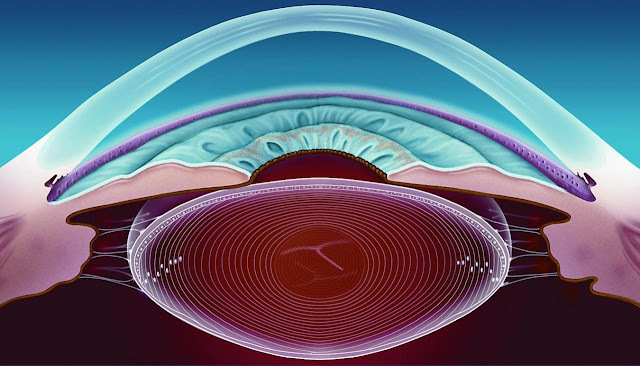 Despite pores to allow oxygen exchange, the inlay can limit oxygen and nutrients from passing through the corneal layers. 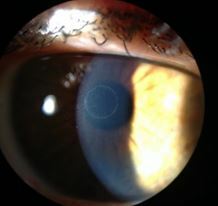 This may result in corneal scarring within the ring where the inlay was placed, and loss of endothelial cells. Take Home: While these surgical procedures are promising, there are numerous side effect risks and a rather high failure rate at just under 10% for each of them. Unfortunately neither procedure is a perfect fix for near vision. Small print and dim lighting will likely still require help with reading glasses, especially as your eyes continue to age. And distance vision will not be as good after surgery in the treated eye -- both procedures create visual distortions, glare, and more difficulty seeing in dim lighting and low contrast conditions. At a cost of at least $5000 (and no insurance coverage -- this is considered a purely elective procedure), some may feel that the cons outweigh the possible pros. But despite all the known expected side effects, many people may find this is a promising alternative to having to wear glasses full time, just as long as they understand and accept the compromises. I would encourage anyone considering an inlay procedure to have their optometrist fit them in a near center multifocal contact lens in their non dominant eye to get an idea of the visual effect before undergoing surgery. An Air Optix MF High add lens will be a fair simulation. If the patient is sorely disappointed in vision achieved, you may have saved them the significant financial investment and potentially irreversible side effects like corneal scarring that come along with a failed inlay procedure!